Is there an option like that and If so where do i find it. I have many forms so the url does not matter i would need it for more then one. (1) Go into your Formbuilder for the Form you want to add this to. (2) Highlight the " Submit Button " Field (this should automatically put you on the Properties: Submit) tab. (3) At the top toolbar of the formbuilder you'll see " Reset Button ", click it once to turn it on. 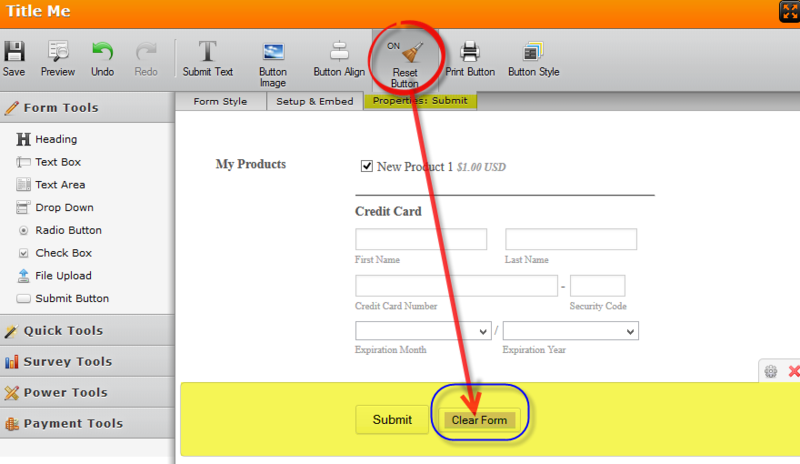 (4) You will then see the " Clear Form " button added automatically to the right side of the submit button on your form. Thanks - too easy when you know how ! !